Maggot Diorama 2 is a beautifully animated (and slightly gross) mini-RTS game where you gather resources and build defenses to keep back the swarms of maggots that are attacking your base. A sequel to the excellent original Maggot Diorama (which was more of a glorified clicker), Maggot Diorama 2 adds more RTS elements and a little more depth to the gameplay while still retaining the excellent hand drawn animation that made the original so great. There are two separate game modes in Maggot Diorama 2 – one that’s more of an RTs and one that is more of an artillery based castle defense game. 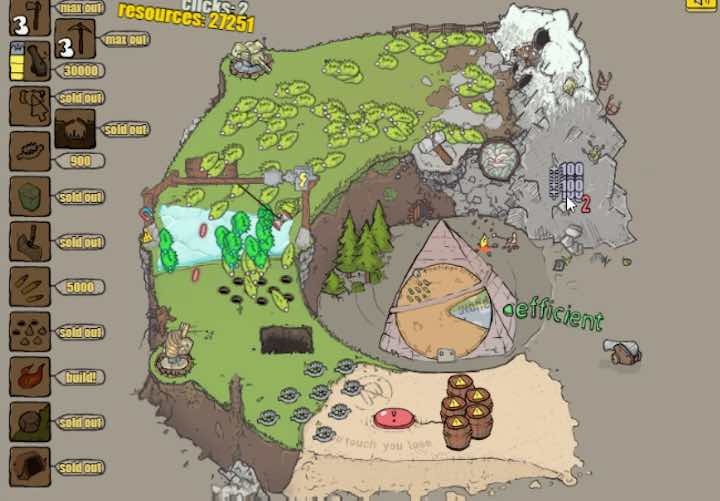 The RTS game mode in this second installation sees you a clicking stone quarry and a forest to gather resources then using them to purchase defenses to help keep the magots at bay. Your aim is to fend the maggots off for long enough to allow you to build a big cannon that can destroy their nest. It’s not particularly tough, but there is a welcome bit of strategy to it, with you harvesting particular resources when it’s most efficient to earn more. The artillery based castle defense mode on the other hand sees you attempting to blast one massive maggot using four different types of projectile. It’s a simple mode, but it’s fun trying to figure out how each weapon works and watching as you blast through the various layers of the maggot. It doesn’t take too long to play through each mode in Maggot Diorama 2, but it’s great fun while it lasts. The hand-drawn animation is excellent and both modes are fun twists on their respective genres. A great little maggot-filled experience well worth burrowing into.